But wait a minute. Here comes one waltzing in on her wannabe “black Fendi peep toes”—and six inches high no less! Enter Kasthuri Kumar aka Katie, detective with a buzz and two bumbling feet. And ‘seasoned’ chic-lit writer Smita Jain pulls her off with elan. Smita knows what she is getting into. 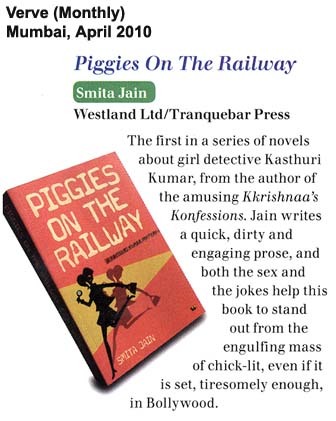 Her successful debut novel ‘Kkrishnaa’s Konfessions’ is compounding into a screenplay for a Bollywood film and as she herself says: “I know I can write a decent murder mystery.” Smita is also curious, “Did you guess who the killer is?” she asks fervently. And I must confess I did not. I was on the wrong railway track all along (much to this author’s delight!) and I certainly enjoyed the bumping ride! Katie is hired by the ‘happening’ scion of Bollywood’s first family to find out just where the leading lady of his latest film has disappeared to and therein starts a riot act. The writing is breezy, racy. The language is colloquial and fun, irreverent too. While the book may be full of clich`E9s it works. Take a careful look around. This is how the yuppies speak. At least in Mumbai they do. The spoken word is nonchalantly insolent. Sample this: “Let’s just say that she once had a splendid hourglass figure. Obviously the sands of time had run it down—all to the bottom.” This, describing someone Katie meets in the process of her sleuth-work. And its not just her characters, even the sub-plots are funny, eliciting that smile while you sit there unbelieving that someone could actually write all this down! 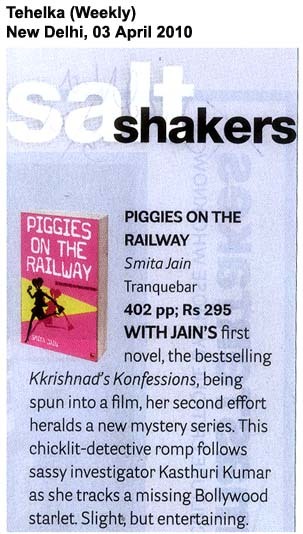 WITH JAIN’S first novel, the bestselling Kkrishnaa’s Konfessions, being spun into a film, her second effort heralds a new mystery series. 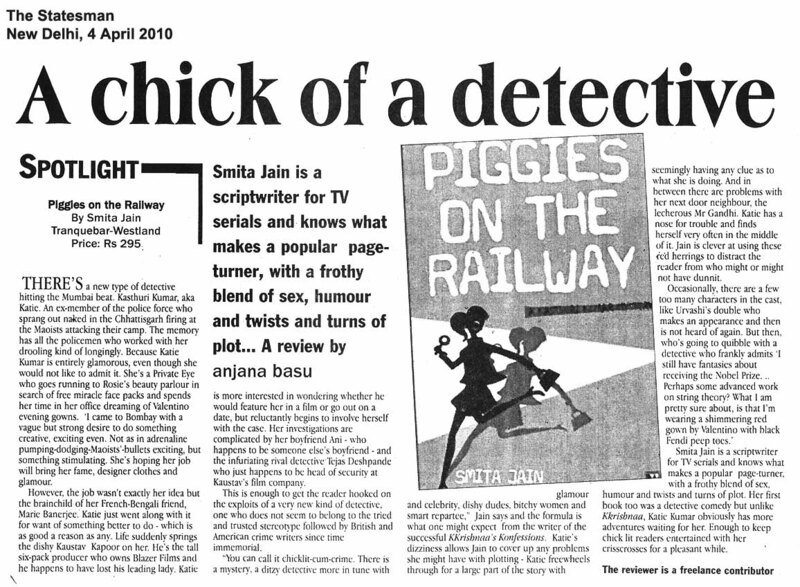 This chicklit-detective romp follows sassy investigator Kasthuri Kumar as she tracks a missing Bollywood starlet…entertaining.